The first amateur dramatic group formed in Horncastle (that we know of) was the Horncastle Amateur Dramatic Company that performed at the Drill Hall in Horncastle. That group apparently stopped performing in the early twentieth century, at which point it was succeeded by numerous smaller groups until February 1973, when an advert (right) appeared, inviting interested parties to a meeting. 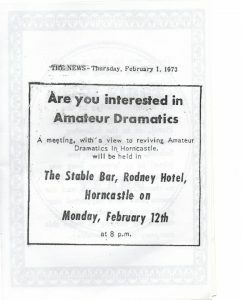 The Horncastle Theatre Club was officially formed a month later. The first performance of the Club was Passion, Poison, & Petrification by George Bernard Shaw, and its success was followed by many others, performing in local school auditoria and village halls. In 1983, the group was renamed the Horncastle Theatre Company, and in 1984 founded both a youth section and the tradition of producing an annual pantomime which continues to this day. The Company can proudly boast that for the last 30 years, every pantomime has been written by its talented members. Indeed, each year usually sees several scripts competing for the company’s vote. Horncastle Theatre Company finally got its own theatre in 1988, after months of fund-raising activities and hard work by the members. Theatre and television actress, Patricia Hodge, was approached to be Honorary President, to which she agreed, attending a major fund-raising event and officially opening the Lion Theatre on 10th December 1988 (by which time she was six months pregnant). There were so many sponsors to invite that two sittings had to be organised, and the same bouquet of flowers was presented to Patricia twice!